Designed by Javier Arana and opened in 1965 Rio Real Golf Club is a fantastic 18 hole championship length course on the outskirts of Marbella. Certainly one of the most visually spectacular in the area the course is laid out in a beautiful valley with a wide variety of trees and offers stunning views down to the Mediterranean. The Rio River crosses the course in several places and the designer made full use of it plus the natural ravines to add visual interest and challenge to the round. As well as the natural obstacles you must successfuly negotiate the man-made lakes and the numerous strategically placed bunkers if you are to score well. The front nine is quite tight and requires good shot making skills but the course does open up more on the back nine. However, even if you are not playing well the views from the course more than make up for a bad round. 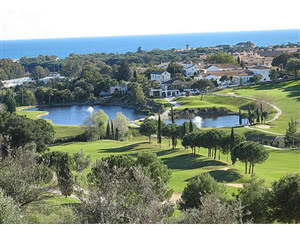 Rio Real Golf Club is a hidden gem that can be found just minutes from the centre of Marbella.